A phalanx of Whitbread/Volvo sailors will be scattered among the crew lists when the Rolex Sydney-Hobart starts on Boxing Day. Among them will be Guy Salter who has swapped his Media Crew Member role on Ericsson 4 in the 2008-09 race for a position on the bow of ICAP Leopard, one of seven super-maxis which will be on the start line for the 65th running of the blue water classic. In a 12-year career, Salter has competed in two America's Cups and prior to his media duties for Ericsson 4, sailed aboard Tyco in the 2001-02 Volvo. 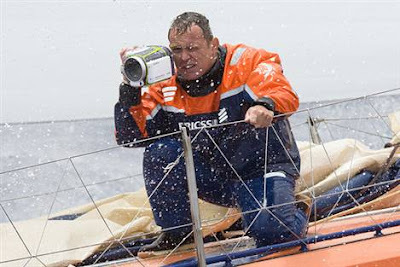 Salter, who has a degree in film and photography, will bring both his sailing and media and skills to bear on Leopard. "Onboard I perform my sailing duties and try and get a bit of filming in as well - the role is definitely a compromise on the media side but there is no room for a dedicated media person on this boat," he says. As for the crew, it reads like a Whitbread/Volvo who's who. "The Leopard crew is full of guys at the top of their game," he says. The list includes his brother Jules (Pirates of the Caribbean 2005-06, Ericsson 4 2008-09), Brad Jackson (New Zealand Endeavour 1993-94, Merit Cup 1997-98, Tyco 2001-02, ABN AMRO ONE 2005-06, Ericsson 4 2008-09), Ray Davies (Merit Cup 1997-98, illbruck 2001-02), Justin Slattery (News Corp 2001-02, ABN AMRO ONE, Green Dragon 2008-09), Jason Carrington (Fortuna 1993-94, Silk Cut 1997-98, Assa Abloy 2001-02, Ericsson 2005-06) and Rob Greenhalgh (ABN AMRO ONE, PUMA 2008-09). Salter reckons they have a legitimate shot at line honours. "I wouldn't have given up Christmas Day with my family and flown halfway round the planet if I didn't think we had a very strong chance of getting line honours in this race. We are here to fight," he says. Leopard will face stiff opposition from the likes of Wild Oats XI, with the 2005-06 Volvo-winning skipper Mike Sanderson (ABN AMRO ONE) and Adrienne Cahalan (Brasil 1 2005-06) among the crew. Sanderson and the18-member crew will be chasing their fifth consecutive line honours victory. Alfa Romeo, which boasts Noel Drennan (illbruck, movistar 2005-06), Craig Satterthwaite (Swedish Match 1997-98, Pirates of the Caribbean, PUMA), Stu Bannatyne (New Zealand Endeavour 1993-94, Silk Cut, illbruck, movistar, Ericsson 4) and Erle Williams (Flyer 1981-82, Swedish Match, djuice, Pirates of the Caribbean, PUMA). Former Ericsson team-mates in 2005-06 Tim Powell and Steve Hayles join forces on Ran, the Judel-Vrolijk 72. Both share the same Volvo CV - Dolphin and Youth/Reebok 1997-98, Silk Cut, Tyco, Ericsson. Etihad Stadium, with Grant Wharington (djuice, Brunel 2005-06) at the controls, also have strong line honours claims.